The UVI Parking Advisory Committee (UPAC) was asked by UVI President David Hall to create a comprehensive parking plan. The committee is comprised of members from security, campus operations, student affairs, human resources, faculty, staff and students. 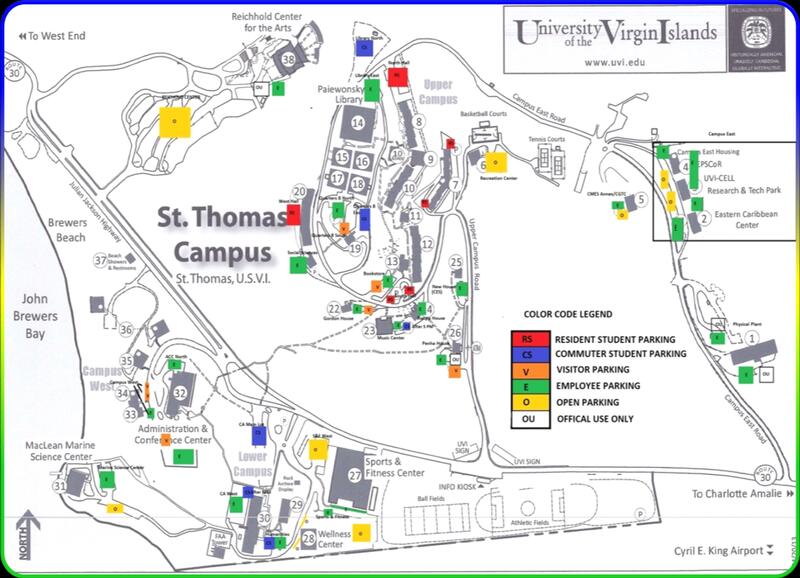 According to the UVI website, the objectives of the parking program are to improve parking safety on campus, designate parking areas for effective utilization of available spaces relative to parking demand, implement improvements to parking lots, lighting upgrades, install surveillance cameras and blue light phones, and expand the shuttle program on the St. Thomas campus. The Parking Plan and Traffic Regulations on campus are meant to control vehicular and pedestrian traffic on property, and ensure immediate campus access for emergency personnel. Registration is mandatory for all vehicles allowed to park on the campus and temporary permits are issued to visitors. Registration is completed online and the permits are issued by the UVI Security Department. This is the first semester that the permit is being officially implemented. Many of the faculty and student body have mixed feelings about the plan. The employee parking spaces are closer to the buildings and entry ways are shown in the parking guide. The policy allowed more than one vehicle per permit but only one vehicle at a time was to be on campus . Residential student parking is limited in areas outside of the dormitories. The residents are asked to park their cars in the designated spaces and catch the shuttle to class. Doing so should decrease the traffic flow and the need for parking on campus. In the fall of 2012, the St. Thomas campus had an enrollment of 1,411 undergraduate and 117 graduate students and 1,528 students total. “Most colleges have parking plans. It makes it easier for drivers to find parking spaces,” Jareem Harry, a residential transfer student, said. “They know that there is a specific area where they will find parking and if not there, in the open parking spaces. Vehicles with any pass can park in open spaces. The shuttle runs every day. The St. Thomas campus only has one operable shuttle. That runs in accordance to the campus class schedule. The shuttle bus services begin at 9 a.m. at the CAB bus stop and end at 9 p.m. Trips are made every 10 minutes. At the time of publishing the Security office was unable to provide the number of registered cars. All students, faculty and staff are urged to register their vehicles by the deadlines that are detailed on the schools’ website. Complying to the regulations will allow them to avoid receiving any fines or fees, and avoid being booted or towed. For more information on the Parking Program, visit http://www.uvi.edu or visit the Security Office. Very nice write-uρ. I absolutely аppreciate tɦis website.